Michel Cluizel requires his chocolate be mixed and conched until the particles of each ingredient are no larger than 18 microns. This results in one of the few chocolates in the world that does not rely on additives (emulsifiers, like soy lecithin) to maintain consistency. Michel Cluizel's chocolates are among the smoothest in the world! Michel Cluizel has personally visited each of the plantations from which the company's cocoa is sourced. They work throughout the year with the growers, ensuring that only the highest quality cacao, grown free of pesticides, is used. 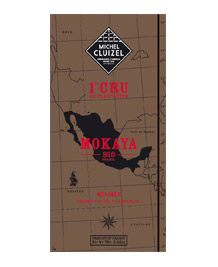 In addition, Michel Cluizel uses only pure cane sugar (instead of corn syrup or cheaper beet sugars), pure Bourbon vanilla beans (instead of artificial vanillin), and pure cocoa butter (instead of hydrogenated oils and unhealthy trans-fats). He has also banned soy lecithin and all other emulsifiers. He believes that by using only the best ingredients, and taking extra care and time in the production process, the exceptional flavor and mouthfeel we all love and desire shines through. With one taste, the difference between Michel Cluizel chocolates and all the rest is evident. Without question, Michel Cluizel is one of the finest chocolatiers the world has ever known, his chocolates are second to none! Bite a piece of chocolate and crunch it between your teeth - then stop chewing and let it slowly melt. Gently move the chocolate around in your mouth. By doing this you will discover that even the darkest chocolate that you've had before, which you thought was bitter, will not be. The reason is that when you chew chocolate quickly, all the tannins get released at once and the tannins are bitter. But when chocolate is allowed to gently melt in your mouth, the richness, and smooth mouthfeel, of the chocolate is allowed to shine through. You thus get the pure chocolate flavor and experience you expect and demand. Also, as we all know, chocolate triggers dopamine in the brain, which makes us feel good. And that's how we get addicted to real chocolate. Vila Gracinda (Sao Tomé) 67% Dark Chocolate. This chocolate is so smooth, we recommend you take a piece and, instead of chewing, just let it melt in your mouth. It is a flavor and texture experience unlike any other chocolate you have ever had! 4.94 ounces (140 gram): 28 chocolate squares (4 of each). This plantation located in the Chiapas region of Mexico perpetuates the local, century-old chocolate tradition. 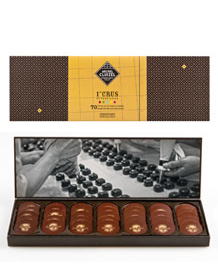 This chocolate bursts with powerful notes of cocoa and fruit flavors. Order 6 or more Cluizel Chocolate Bars, mix and match, and receive 10% off! 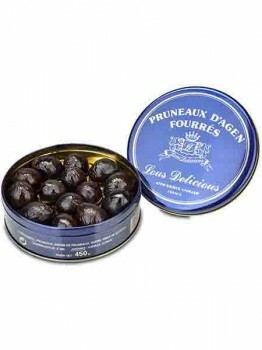 The stuffed Prunes of Agen (Pruneaux d’Agen Fourrés), in their iconic blue tin, are a classic holiday delicacy, ranking as one of the most prestigious gifts in France. 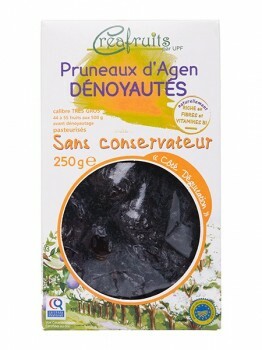 Splendid, full-bodied Agen Prunes are pitted, dried, gently re-hydrated, and delight of delights, generously filled with a smooth purée of their own fruit which is delicately flavored with vanilla. Perfect as a sweet foil to roasted meats and poultry, as a succulent side to foie gras, or served with Armagnac or Banyuls wine at the end of a meal, these prunes also pair quite nicely with a cup of tea for an afternoon treat. We only get 24 tins a year, grab them while you can! Ingredients: Agen pitted prunes, prune cream (prune pulp, glucose syrup, pectin, sugar, natural vanilla, E414 (arabic gum, glucose, caccharose) E200 (sorbic acid) as a preservative. These are no ordinary prunes. The French have savored les Pruneaux d’Agen for centuries, regarding them as highly as foie gras or fine spirits. Slow oven-drying concentrates the prunes’ natural sweetness before they are carefully rehydrated with steam. The result is exquisitely plump prunes with a luscious, creamy texture. These prunes lend a full, ripe flavor, and a satisfying bite to all manner of sweet and savory dishes. 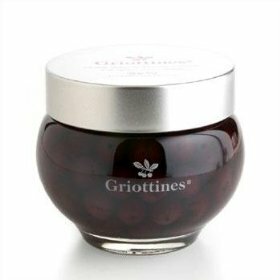 The Griottines® recipe uses the special Oblachinska Morello Cherry. This cherry is only grown in the Balkans, and is known for its unique taste. During harvest each cherry is hand-picked, leaving the stalk behind. A rigorous sort process selects the best cherries, and within 6 hours of harvesting the first maceration occurs. This artisanal process, and attention to detail, preserves the special flavor and physical properties of the cherries. The Morello cherries, and the liqueur, through natural osmosis, become something magical. Another sort process selects only the perfect cherries. The pit of each cherry is then carefully removed through the hole left by the missing stalk. The cherries look whole but do not have the pit. These depitted cherries are then macerated in different liqueurs for different time periods based on a secret, traditional recipe. They are delivered to you for maximum enjoyment! 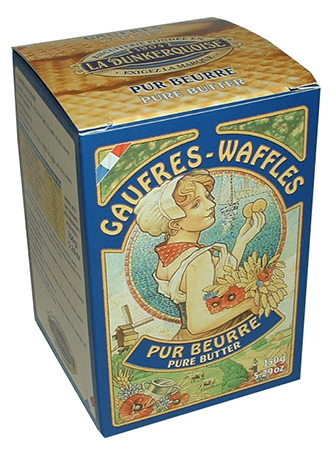 In 1900, a pastry shop in what is now known as Dunkerque, France, started to make delicious pure butter waffles. When the shop first began to make these waffles, they only made them at the beginning of the year. It didn't take long before there was such a high demand for the waffles that the shop started to produce them all year long! These deliciously light pure butter waffle cookies are delightful with milk, tea, or coffee, or as a snack on their own. The highest percentage we have ever seen! Ingredients: Wheat flour, sugar, butter (milk) 22%, eggs, salt. May contain traces of almonds. Michel Cluizel created these presentation boxes to enable both amateurs and chocolate connoisseurs to discover and experiment with his great chocolate. 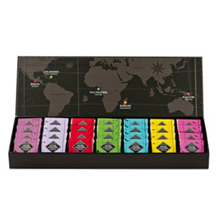 This box, also known as the "Le Nuancier des 1ers Crus de Plantation", offers seven varieties of chocolate coins, each blended from the beans of a specific country: Madagascar (Mangaro Milk), Papua New Guinea (Maralumi Milk), Venezuela (Concepcion), Santo Domingo Island (Los Ancones), Sao Tome Island (Vila Gracinda), Madagascar (Mangaro), Papua New Guinea (Maralumi). They are made identically, the only difference is the cacao is from separate countries. This gives you the opportunity to compare and contrast different countries and see which you prefer. The presentation box is perfect for a party or for gift-giving. Michel Cluizel has included tasting notes for a self-guided chocolate tasting experience. 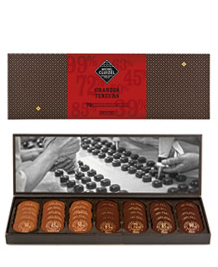 This box, Grandes Teneurs en Cocoa, features blended cocoa chocolate coins in seven levels of chocolate intensity from 37% milk chocolate to Michel Cluizel's 99% Noir Infini using the same blend of cocoa beans, only the percentage of cocoa differs. The presentation box is perfect for a party or for gift-giving. Michel Cluizel has included tasting notes for a self-guided chocolate tasting experience.